postcard # 18 - This one is easier than it looks once you get your bearings. At first I thought that the postcard people had made a mistake. It had to be mislabeled. It says Napoli - via Roma, but there is no square with a statue like this on via Roma. Ah, but there used to be! 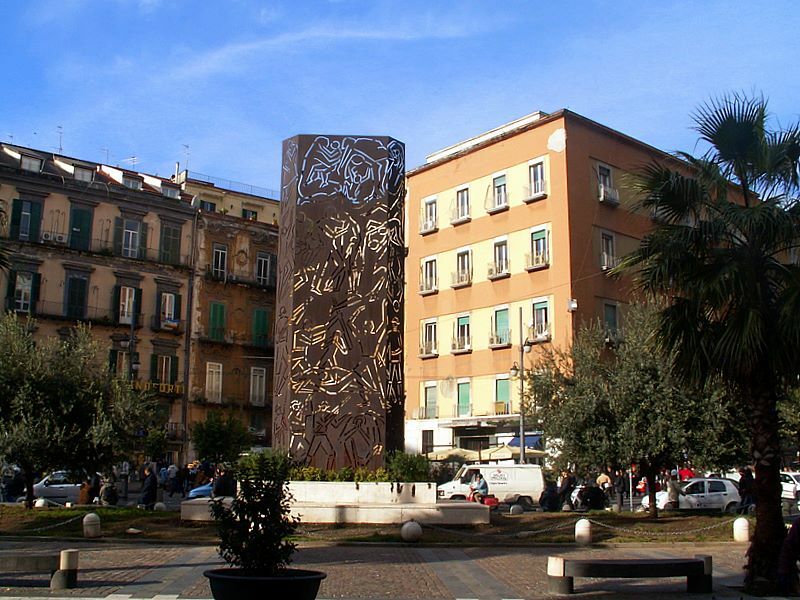 This is another of the famous traveling monuments of Naples (the most widely traveled one is here.) Every time they rebuild part of the city, they have to move these things. First, via Roma is the same as via Toledo, the original name for this street, built by the Spanish in the mid-1500s under viceroy Don Pedro Alvarez de Toledo. The street starts at the Royal Palace and runs north in a straight line for a about 1700 meters (just over one mile) to the National Museum. That straight line was the new western 'wall' of Spanish Naples. 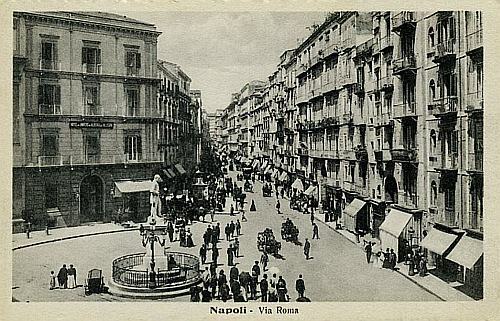 The point of view in this card is from about the halfway point, today called piazza Carità, facing north towards today's Piazza Dante and then the museum. The confusing thing, at first, is that everything seems different today. Really, everything on the right-hand side of the street has changed, but the left-hand side has remained much the same. If you start walking out from the Royal Palace, you immediately find large buildings on your right put up during the great rebuilding of Naples in the 1890s, the Risanamento, the most obvious of which is the large Galleria Umberto I. However, on the left, about the only significant change from when this postcard photo was taken is the bottom station of the Central Cable Car (marked as 'Augusteo' on this map). That station, however--indeed, all the buildings on the left and in back of you in this photo--are the front of what are called the Spanish Quarters, square block after square block of buildings originally put in place by Toledo to garrison troops. They are still there. The greatest change after the risanamento in this part of the city was the large-scale construction under the Fascists in the 1930s. 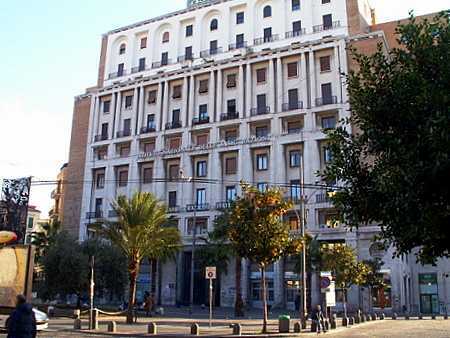 (See Fascist Architecture in Naples.) Starting from this square, they cleared away everything on the right and put in place what was called "Rationalist Row" (referring to a style of architecture). Moving east (to your right in the above postcard photo) there are at least seven or eight monuments to architectural megalomania, including the main post office. Both photos, here, (left and right) show that all of the buildings on the right-hand side of the street in the old photo have been removed. Via Roma runs between the old buildings in back on the left and the orange building (also from the 1930s). Everything from that point back to where you are taking this picture on the left was cleared to make a large square, Piazza Carità. (The metal monument is from post-WWII, a monument to Salvatore d'Acquisto) If you now walk out across the square, turn and take the picture on the right, you see the beginning of Rationalist Row, the National Insurance Building from 1938 (image, above right). In order to do all this in the 1930s, they had to move the statue. I knew I had seen that statue somewhere else. It just took a closer look to identify it (mainly from the position of the hands). It is Carlo Poerio (1803-1867), an Italian patriot very much involved with the Risorgimento, the movement to unify Italy in the 1800s. Once that was established, the rest fell into place. The statue is signed by Tommaso Solari and dated 1877. We may assume that the statue was erected promptly; that is, the postcard was shot after 1877 but probably not much. If we examine the street scene, there is a tram of some sort, but there don't seem to be tracks, which means that it is horse-drawn. That jibes with the fact that trams on tracks were just starting to appear in 1875. So, I make the card to be from 1877-1880. Carlo Poerio was moved to a much more amiable location. He now stands at Piazza San Pasquale in a nice little square in front of a church just one block from the gardens of the Villa Comunale near the sea.